The Poltifract Safer Neighboroughoods Team, which is part of West Yorkshire police have had great results from their Facebook page with debates on many subjects; the subject that created the most debate … yup, pavement parking. I was particularly pleased to see this report on a visit to a particular street by the police: “PCSO Paul Guest visited a street in Pontefract yesterday after reports of a number of vehicles parked on pavements. PCSO Guest was suprised to find that not only were the vehicles parked on the pavements, they were double parked and some vehicles were parked on the bend at the end of the street”. They went on to say: “PCSO’s will continue patrols in this area and if the same vehicles are seen parked on the pavement again, fixed penalty notices will be issued.” Also that “The pictured vehicles are both illegally parked. As you can see prams and wheelchairs cannot safely pass the vehicles on the footpath. They would have to go into the road to pass the vehicles”. Great stuff. Not all police forces agree that totally blocking a pavement is obstruction, for example the police in Bristol apparently deemed that this car was not causing an obstruction. Personally I am very interested is West Yorkshire’s use of Facebook. Many public bodies seem to shy away from debating anything in public. My experience locally is that the police are far better at this than local councils. Hopefully we will see many more Facebook pages for communities to debate with authorities on many subjects in the future. On Friday I have a meeting with my local MP, Ben Gummer,where I made a presentation of the issues and their urgency and was pleased to get his support. He offered to provide a link to the campaign from his new website when it goes live in a ‘few weeks’ and to also draw it to the attention of Norman Baker, the Parliamentary Under-Secretary of State for Transport with responsibility for ‘sustainable travel’. All good stuff. As it happened, Julian Huppert, MP for Cambridge was pressing Terrasa Villiers, Minister of State for Transport in on the issue of pavement parking in the Commons on the same day saying: “Could the law be adjusted so that the presence of a vehicle in a cycle path or on a footway be taken as evidence that it was driven there, rather than appearing magically, as seems to be assumed at the moment”. Unfortunately Villiers failed to acknowledge or respond to the request. This problem isn’t going to get fixed over night! 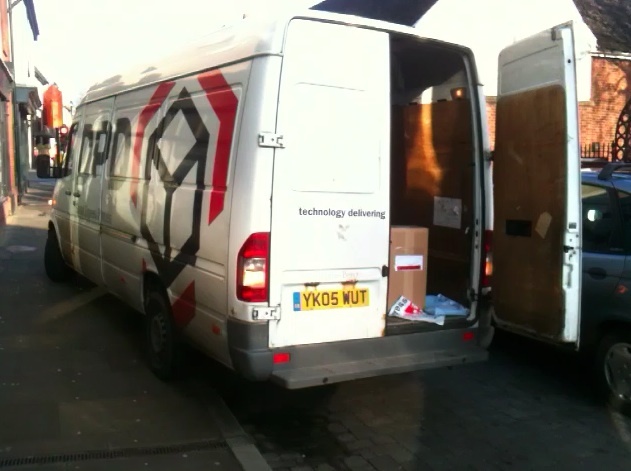 DPD Express Parcels demonstrated the issue to be convincingly outside my MP’s office by parking diagonally across the pavement for no reason and then trying to justify it. 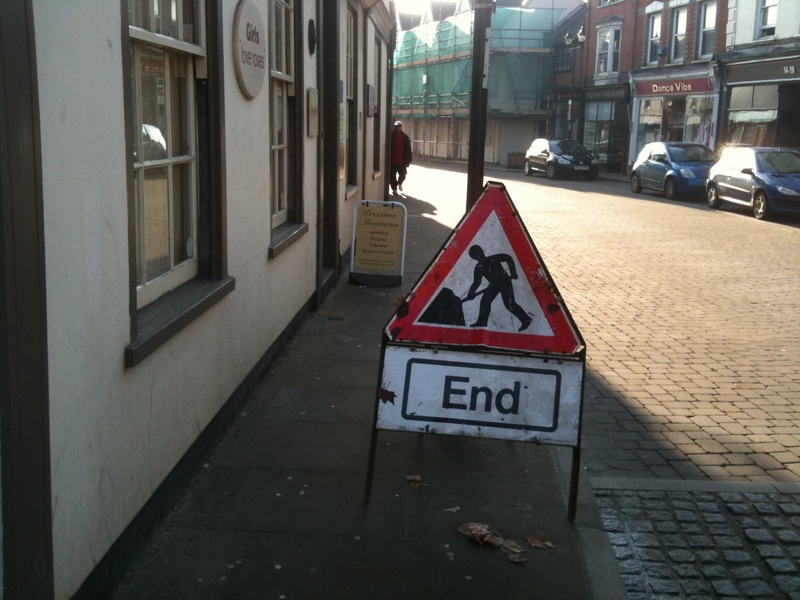 And then as I left I came across this nice pair of signs positioned to cause as much trouble as possible including a road works sign which maintenance companies are apparently required to leave across the pavement. Why obstruct the pavement with warning signs! Back in March 2010 it was reported that Brighton and Hove council was looking into using a by-law created by East Sussex Council which banned parking on verges but which hasn’t applied to the area since the 1990s when Brighton and Hove became a unitary authority. Councillor Meadows, who was promoting the idea explained that: “Parking on grass verges not only causes a muddy mess during winter months but also problems for people wanting to cross roads safely”. Given that I can find on further reference to this idea then I suspect that it may have been dropped. The local paper did however publish a helpful photo of a messed up verge. Needless to say, one doesn’t need to go to Brighton to see such scenes, there are plenty available closer to home!